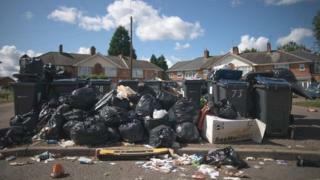 More than 300 Birmingham bin workers are starting the first of a series of strikes in a dispute with the council. It stems from claims some staff have been “blacklisted” for taking part in industrial action in 2017, when piles of rubbish were left on the streets. The Unite members have been working to rule since 29 December over a payment given to GMB members who did not take part in previous strike action. A “reasonable” offer had been made to unions, Birmingham City Council said. Collections in the city have moved to fortnightly, which the council said was to ensure “reliability of service” until the dispute is resolved. What’s going to happen to Birmingham’s rubbish? Picket lines will be in place at four council refuse depots from 05:00 GMT until 14:00, Unite said. Unite assistant general secretary Howard Beckett said the action was a “last resort” after talks to resolve the row collapsed last week. The three-month long strike action that started in June 2017 was part of a dispute over job losses. But Unite said members were later denied a council payment made to GMB members who did not walk out. The council and GMB said the payment was a settlement because the GMB was not consulted during the talks that ended the action, but bin workers voted in December to take new industrial action. Workers will be striking two days a week over the next five weeks from Tuesday, with Unison workers, who are also involved, due to stage their first walk-out this Friday. “This industrial action is entirely of Birmingham council’s making,” Mr Beckett said. He said the council made “secret payments” to bin workers who did not go on strike in 2017 and the council “refused to accept that it had blacklisted our members and refused to make an equal payment to our members”. The offer tabled by the council last week “was worse than the one which Unite had already rejected”, he said. But the council has urged the unions to put it to members “so they can give it the serious consideration it deserves”. Usually, Birmingham residents receive a weekly general waste collection and a recycling service every two weeks, though some residents in the city have complained of missed collections over the past few months, even before industrial action begun. The council has said that from Monday, residents should put both bins out on what would be their normal recycling collection day, and that a reasonable amount of “side waste” could also be left. Collections were not being suspended during any strike action, the authority said. Speaking last week, councillor Brett O’Reilly, cabinet member for clean streets, waste and recycling, said the authority was “determined” to resolve the dispute and apologised for any missed collections so far. “But until we reach a resolution we must do everything we can to minimise the disruption to the people who live in Birmingham,” he said. Both unions are also pursuing legal action against the council as part of the dispute.